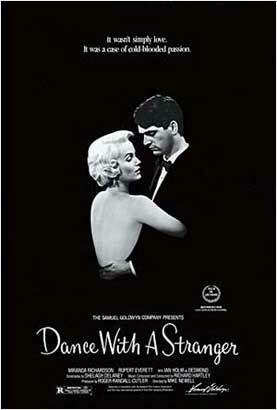 If you want to see a film about real life obsession and a big fat crime of passion, check out Dance with A Stranger. From the moment that rich boy David Blakeley (Rupert Everett) claps eyes on the vivacious tart with a heart, Ruth Ellis (Miranda Richardson), it’s trouble with a capital ‘T’. Blakeley is introduced to Mrs. Ellis in her natural habitat, a racy London speak-easy in 1954, by the diminutive cockney businessman Desmond Cussen (Ian Holm). Cussen has a not-so-secret crush on the captivating hostess but as the affair between the pair begins to smoulder, he watches with mounting disappointment. Blind Freddy could see that Ruth is besotted with the reckless racing car driver, a condition only encouraged by the drunken rake who hounds her like a vicious puppy. When their relationship becomes publicly abusive, however, Cussen tries to intervene by accommodating the brittle blonde and her son Andy. Soon his own obsession finds him reluctantly assisting Ruth in her efforts to reclaim some modicum of dignity. In one instance, he drives her to a country pub where, in a moment of unbridled anger, she lets fly at her lover and the toffee nosed snobs in whose company he chooses to revel rather than fulfil his promises to her. Richardson, seen here in her breakthrough screen role, is nothing short of smashing, depicting all the ecstasy and humiliation that this affair offers up to Ruth. One minute she’s like Marilyn Monroe, shrieking with delight, the next, she’s twitching in a tranquillised twilight zone of confusion. Director Mike Newell, who made the hit Four Weddings and a Funeral and who’s currently in post production with Harry Potter and the Goblet of Fire (again featuring Richardson as Rita Skeeter), drives this compelling story about the final year in the life of the last woman hanged in Britain, right through to its sad and lonely finale. It’s then, as we watch Ruth’s scarlet fingernails trace the grammatically scrambled words of a letter she has written in jail to David’s mother, that we understand the bottom line; Ruth and David were from vastly different social spheres, and in ’50s England, that cut no ice, no matter how hot the passion.